7/8" in size. Whitewashed gold finish. 1" in size. Antique gold finish. 1" in size. Whitewashed gold finish. 1" in size. Hand painted, gold finish. 7/8" in size. Pewter Finish. 7/8" in size. 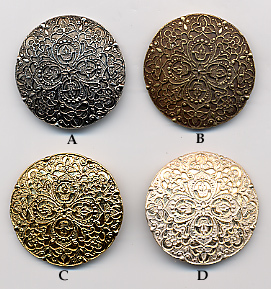 Hand Painted pewter finish. 5/8". Pewter only. Gold sold out. 7/8" in size. Antique gold finish. 1 + 1/4". 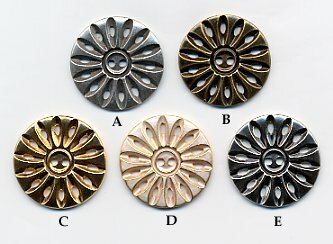 We also have the same button style available in glass. Only select from the colors shown in the picture. 1 + 9/16". Only select from the buttons shown in the picture. 5/8". Hand Painted. Only select from the button styles shown in the picture. 1/2". Only select from the buttons shown in the picture. 1 + 1/4". We also have the same button style available in glass. Only select from the buttons shown in the picture. 7/8" in size. Brass finish.